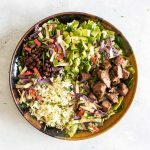 This fast and fresh steak taco salad for two has tender pan-seared sirloin, creamy diced avocado, black beans, pepper jack cheese and a super simple 3-ingredient salsa verde dressing. Marinate the steak: In a resealable bag, combine 2 teaspoons of olive oil, seasoning, and lime juice. I find it’s easiest to seal the bag and sort of mush it around until the ingredients have combined. Open it back up, place the steak inside, reseal it and smush it around again until the steak is evenly coated. You can keep the steak out on the counter to marinate while you prepare the dressing. Make the dressing: In a small bowl, combine the sour cream and salsa. Depending on the thickness of your salsa, add enough lime juice to thin the dressing so it’s pourable. Place the dressing in the fridge. Cook the steak: Heat 2 teaspoons of olive oil in a skillet over medium-high heat. Remove the steak from the bag and pat it dry with a paper towel. Place the steak in the hot pan and sear it on one side for four to five minutes. Turn the steak over and cook it until it develops a nice sear, about two to three minutes. Turn the heat off and cover the pan with a lid. Leave the steak in the pan for two to three minutes. Transfer the steak to a clean plate and let it rest while you assemble the salad. Assemble the salad: Place the greens in a large bowl and top with the cheese, avocado, black beans, tortilla strips, and fresh cilantro. Cut the steak into bite-sized pieces and place it on top of the salad. Drizzle the dressing over the top (or keep it on the side) and serve. When I make marinades I make just enough to coat the piece of meat so you’ll notice you won’t have a lot of excess of the marinade, which means you don’t have to throw any out. I find it’s easier to marinate the meat in a bag, but you could use a dish. Just be sure to get the meat totally coated. For the seasoning be sure to use a seasoning mix – not just plain old chili powder. You want to use something that has a mix of chili seasonings. I love salsa verde which is a green-colored salsa made with tomatillos and jalapenos, but you could substitute a tomato-based salsa if you prefer. Either way, I recommend choosing a salsa that’s not super chunky – I find a smoother sauce works better for the dressing. For the tortilla strips like to use the small ones that are for salads. I use a brand called Fresh Gourmet that is sold at most grocery stores.